This entry was posted in Travel and tagged Australia, Blue Mountains. Bookmark the permalink. Bryan still rushes to the railings at viewpoints – I doubt you would have liked the recent Grand Canyon rushing…what a great trip all those years ago! Hoping for your positive response soon. 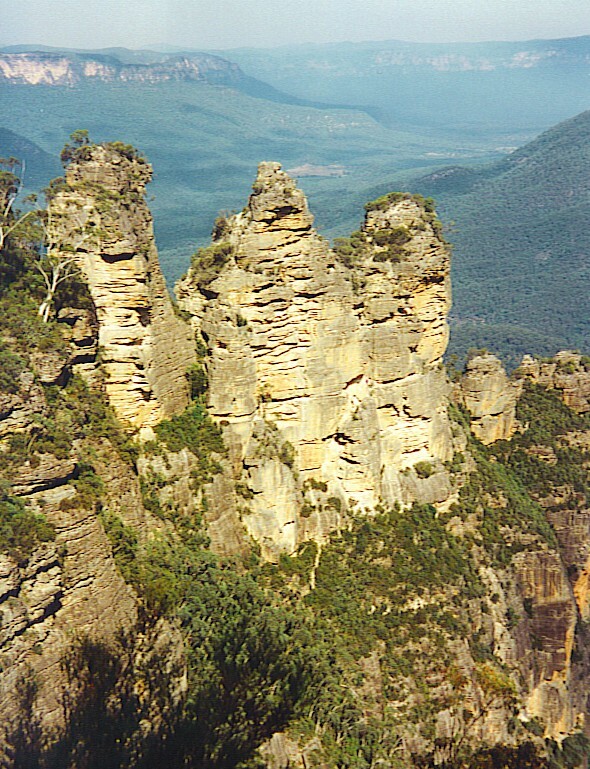 Yes, you may use the photograph of the “Three Sisters” in Australia. Thank you for asking permission; I am happy to give it to you. I had a look at your website, and the objectives of your organization are certainly worthwhile. I wish you success, and look forward to seeing the story that my photograph will illustrate! “I want to marry one of these beautiful girls” – he said. “If one of them gets married, the others are going to think they are ugly. I am looking for a tribe whose warriors can have three wives” – answered the wizard as he walked away. And for many years he traveled all over the Australian continent but never managed to find such a tribe. “At least one of us could have been happy” – said one of the sisters when they were already old and weary from so much wandering. “I was wrong”, answered the wizard, “but now it’s too late”. And he turned the three sisters into blocks of stone. That story makes a very good point — that the happiness of one does not necessarily mean the sadness of others. I will contact you directly with my email address. Thanks again for your thoughtfulness.